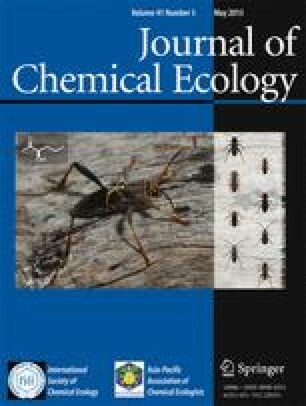 A detailed comparative analysis of the exocrine chemistry of nine Bruneian Camponotus species in the cylindricus complex is reported. Workers of these species are known to have hypertrophied mandibular glands and release their glandular contents suicidally from the head by rupturing the inter- segmental membrane of the gaster. All of the species produce mixtures of polyacetate-derived aromatics, including hydroxyacetophenones, which display pH-dependent color changes, and aliphatic hydrocarbons and alcohols. In addition, three species contained (6R)-2,6-dimethyl-(2E)-octen-1,8-dioic acid (9) or (3S)-8-hydroxycitro-nellic acid (10a), previously unreported from insects. These compounds were characterized from their spectral data, and confirmed by comparison with synthetic samples. The allomonal role of these compounds is based on numerous field observations, and their chemotaxonomic value is presented.